In this exploding CBD market, where so many CBD products are coming out of the wood-work, who can you trust? We saw a need and had a simple plan when we started Source CBD Oil. People want to know what they are putting into their body and want to trust the source of the product. Our goals for providing the best CBD product are simple. A variety of phytonutrients that are powerful antioxidants with anti-inflammatory and immune system benefits. The sub-group of cannabinoids produced by hemp (and other plants), includes Cannabidiol (CBD), Cannabigerol (CBG), Cannabichromene (CBC) & more. Aromatic oils found in hemp and other plants. Terpenes bind to receptors in the human body resulting in a variety of health benefits. Nearly all of the major terpenes in cannabis are either analgesic (anti-pain) or antiinflammatory. Whether produced by the body or in a plant, these naturally-occurring fatty compounds interact with the endocannabinoid system, which includes CB1 and CB2 receptors. Through their interactions with cannabinoid receptors in the body, the compounds are key players in normal immune and central nervous system functioning. ZERO THC. Source CBD Oil products contain absolutely Zero THC — meaning you enjoy all of the benefits of CBD with none of the psychoactive side effects. We believe in our products 100%. We offer a 30 Day Money Back Guarantee. If you are not satisfied just let us know. We offer Free Shipping on orders over $99. Our goal is to ship products the same day you place your order. Enhanced absorption. Our water-soluble softgels are 4x more absorbable than a standard tincture oil. Relief comes faster, and you see results with smaller serving sizes. Our hemp is proudly grown in the U.S.A. After 3 year search, we chose Folium Biosciences in Colorado due to their high farming standards and state-of-the-art production process. Broad spectrum. Source CBD Oil products contain all of the cannabinoids present in a proprietary, nutrient-rich strain of hemp known as PCR hemp. You get the entourage impact of all the phytocannabinoids and terpenes working together. High Quality and Consistency. All of our products are manufactured in a GMP-certified facility that conforms to FDA guidelines. All our hemp comes from the same strain, ensuring uniformity. Plus, our hemp oil comes from the exact same extraction process in the same facility — meaning you receive a product that’s reliable, predictable and effective. Testing and Transparency. Every batch of our PCR hemp oil is tested to ensure that the products you receive are the highest quality available, without any metals, pesticides or THC. We post all our lab results. Trust Your Source. We realize in this exploding industry it is critical to know your source and and trust what you put into your body. That's why we share any part of the production process and provide all of our documented lab results on our site. Absorption Matters. One of our goals is to provide a CBD product with superior bio-availability. In other words, we want to make sure that our products could be easily absorbed into the bloodstream not simply passed through the digestive system. Source CBD Oil partnered with Folium Biosciences who uses a patent pending formula designed to maximize absorption called nanoemulsion. 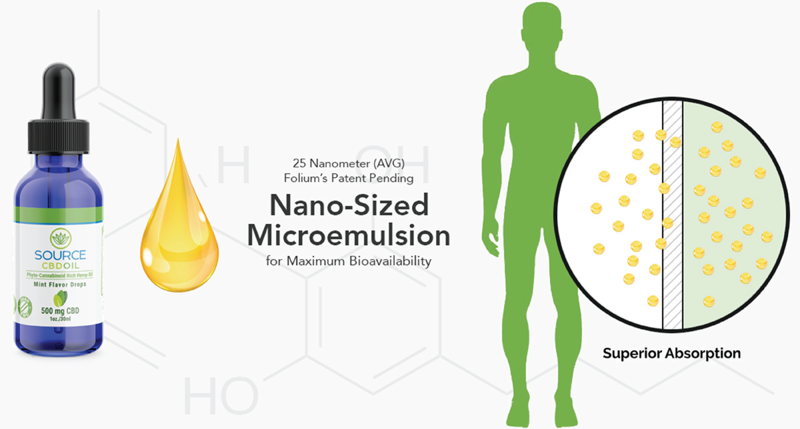 The average size of our hemp oil droplet in the nanoemulsion form averages 25 nanometers. The industry standard is 100 to 5000 nanometers. The small size of the nanoemulsion hemp oil leads to much higher absorption in the bloodstream. This patent pending formula allows more of our CBD to be absorbed and greatly increases the overall efficacy. © Copyright 2019 - Source CBD Oil. All Rights Reserved.